OK, I have assembled the tops. Now the question is, do I go on with my original idea of making dresses, or do I just make them available as tops for a child size 4-5. My daughter is a size 6, so these are a little small for her, in our opinion. But it does show a size 6 can wear them, too. I am still planing on adding embellishments to these as dress or shirt. The reason I ask if they should just be shirts is, as a shirt they are approximately $40.00 to $60.00 each. Where, if I make them into dresses, the price would go up in the hundreds. I want things to be affordable; but, to make these into dresses, I am looking at tons of hours more per dress to make the crochet skirt part. In the photo, my daughter is wearing a long, white undershirt that goes over her hips because the undershirt belongs to her 10-year old sister. 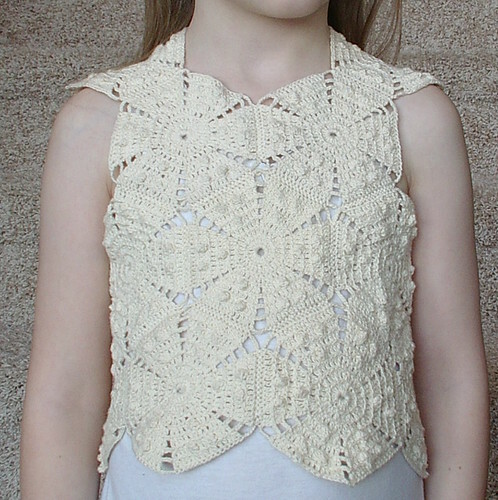 These crocheted shirts actually would hit the waist of a size 4-5; on a size 6 ,the belly button shows right in the middle ,which embarrasses my daughter, so we made sure not to do that with the undershirt. I will be adding an edging which should correct that problem. There are two shirts of the top photo and one of the bottom photo. 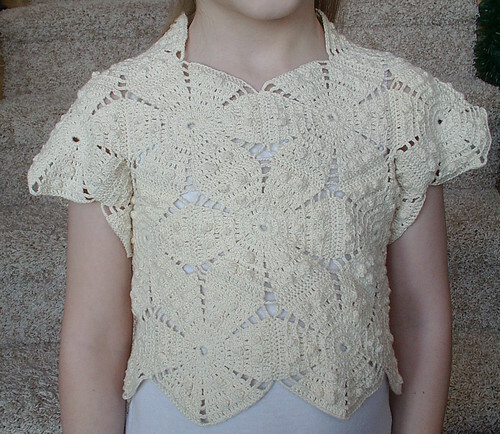 I can make sleeves for the second one in a different color if someone so desires that, too, like I did for my daughter's dress in the bottom of this post. At $40 I would snap one up for my sister's daughter. I don't know that I would go into the hundreds although I would understand the price. It seems very labor intensive to make the skirt. I think they would be quite nice as a skirt and top set. I could imagine a little girl wearing it to a party with a velvet skirt or just wearing it with something more casual.